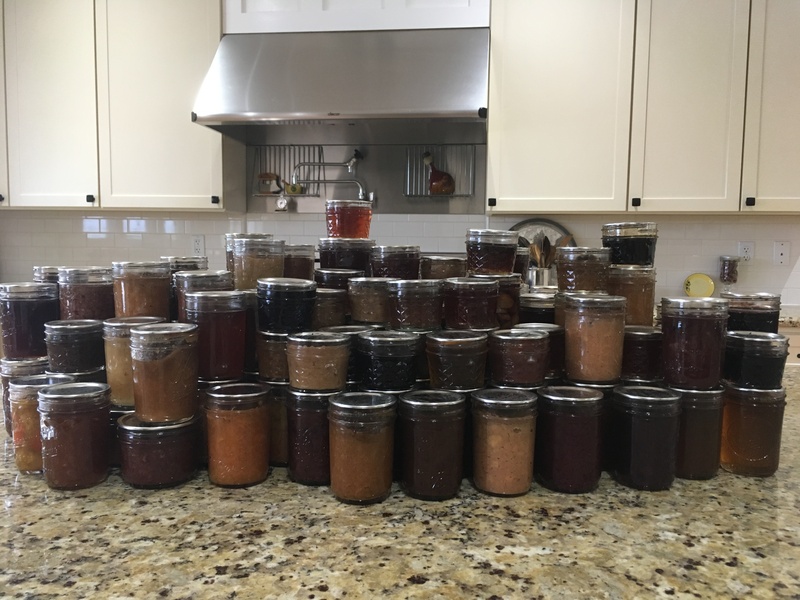 I keep seeing an article about 7 mistakes people make while canning, so I wanted to give my two cents on this topic since I have been canning for quite some time! The first mistake listed is about how oven canning is not safe and I agree. The oven can’t get the food in the jar hot enough to kill the bacteria and should not be trusted. The next mistake is flipping jars to seal them. This is also not a good idea. The seal with not be strong enough and using a water bath or a pressure canner is necessary in order to kill the bacteria in the jar. Another mistake is using Paraffin waxto seal the jars – this does not provide a proper seal and will allow bad bacteria to grow. They also talk about inventing your own recipe. While I have to admit, I make up recipes all the time, the concern with this is the amount of acid needed to safely preserve food might be off (a pH of 4.6 or lower is advised). Another issue could be the temperature might not get high enough to adequately destroy bacteria and mold spores that are present. The next mistake is if it’s canned at the store, it’s ok to can it at home. This is a problem. You cannot can certain foods at home, such as puree pumpkin ,because they are so low in acid and/or dense that you cannot kill all the bacteria in the jar with your non-commercial equipment. Next they talk about not needing to boil the lids. They started making new lids a while ago saying just wash in hot soapy water and dry and set aside until ready to use. I tried that and half of my jars do not seal – I was not happy. So I always dip the lid in hot water right before I put it on the jar. This softens the rubber on the lid and I have a high success rate with this method. The last mistake they mention is canning butter. I have never heard of anyone canning butter but it’s much easier to just freeze it as a way of preservation. Although I agree with all of these “mistakes”, the article does not mention the most important aspect of canning – CLEANLINESS. If you have a dirty vent above your stove PLEASE do not can. Here is why: when you can you have a big pot of boiling water on the stove. The steam from the pot rises and will release the grease from the vent. This grease can fall into your pot of jam and now you have bacteria in your jars which can cause food borne botulism. 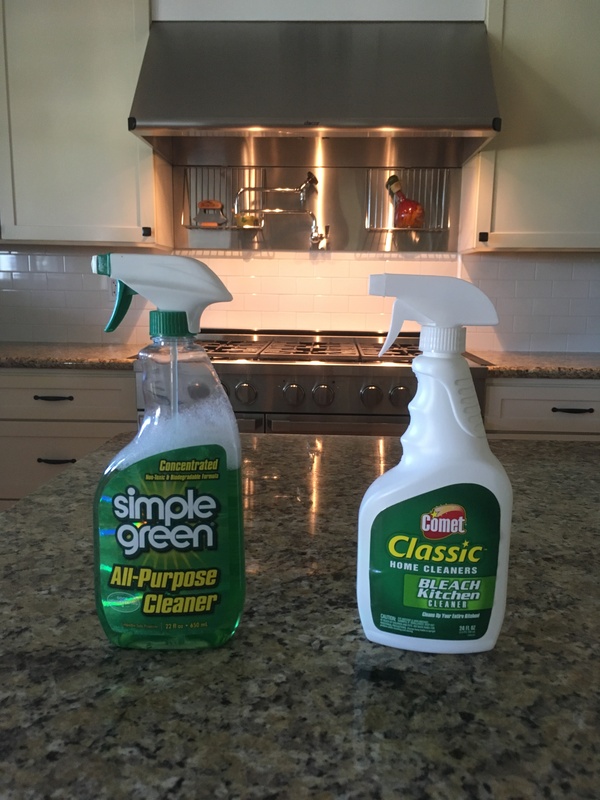 And of course your kitchen should always be clean when starting to can. Instead of worrying about these mistakes, come take a class with me so you have none of the stress and all of the fun! It’s time to get ready for the new canning season. Say goodbye to the 2014 Bourbon Peach Butter you forgot you had and so many more jars that we’re not consumed. I have to admit, I have been bad about this. One should go through their pantry every year. You may be asking why. Here is why. You should be taking note of how much jelly you have left over, or how you have no more pasta sauce left, or how you have very little jam left. With the new canning season here you will ned know if you need to make more jam and less jelly or more pasta sauce. This is also the time where you check seals on jars, look for discoloration or separation. This is a great time to get your pantry organized. Pull old jars to the front of the cupboard and when you have new jars place them behind the old jars. Always eat the older jars first. I think the last time I did this was in 2013. So you can imagine I have a lot of jars to empty. Not one of them had the seal broken. i had some separation and discoloration with some jars. 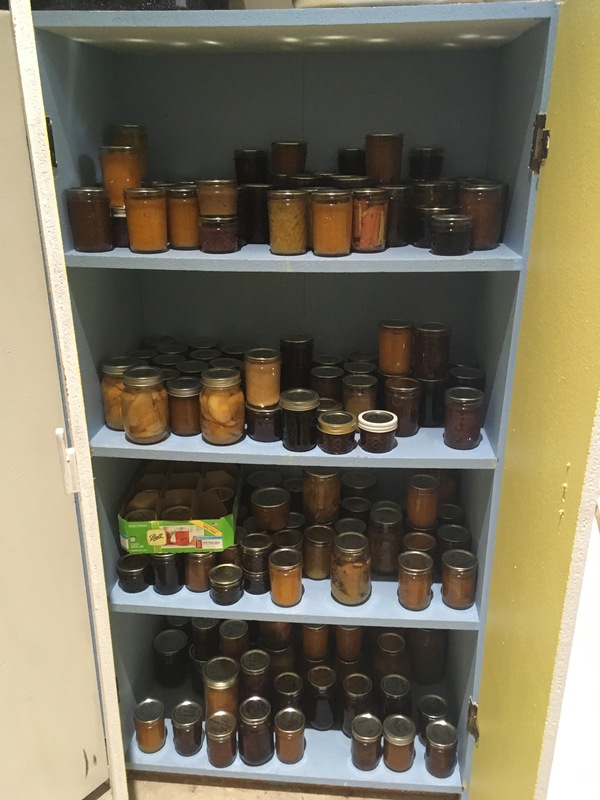 I’m very lucky in having a great storage room that is well insulated for All In A Jar’s pantry, tools, supplies, jars, and spices. It stays nice and cool in there. That is probably why I had no jars with broken seals. It’s OK to say goodbye to those old jars. It is making room for the new jars. Let them go. FYI I emptied 53 jars (4) one ounce jars,(92) half pint jars (21) pint jars, (4) quart jars. They are clean and ready for this canning season. Over the years, I have learned, I don’t care for Jelly and relish. 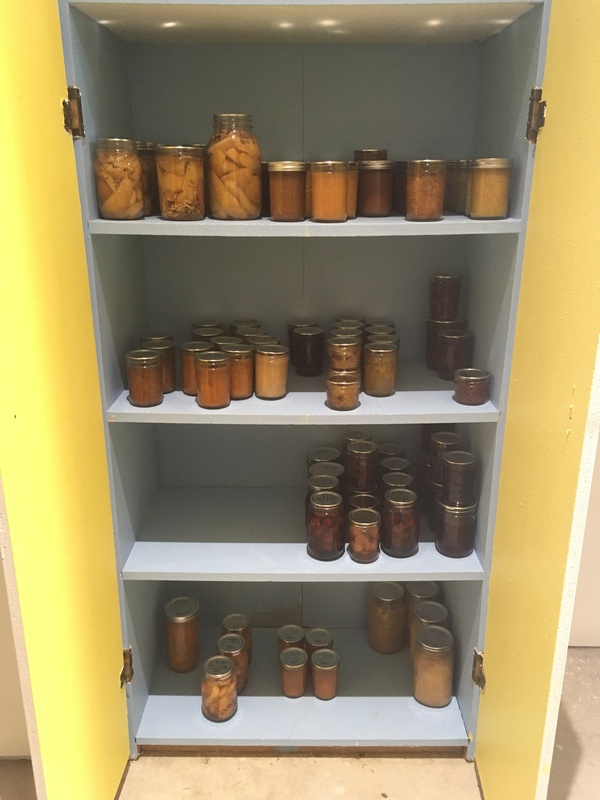 So this year I won’t can jelly and relish for my personal pantry. I will be mindful of what to grow in my garden for canning. My fruit trees will not be producing for a few years. I will go to the fruit stands and farmers market for my peaches, pears, apples and apricots. I will always try to come up with new recipes for my family and students. That is half the fun of being a canner. Next, I will be cleaning out the two freezers. Then it will be the spice drawer. Happy Spring Cleaning. Happy Canning. Freeze it … for those cold winter nights ! You don’t have to know how to can to be a good preserver. I love winter and the food that comes with the cold wet weather. My husband and I enjoy hardy soups, stews and chili. I like to make a big pot , but it usually is to much for just the two of us. 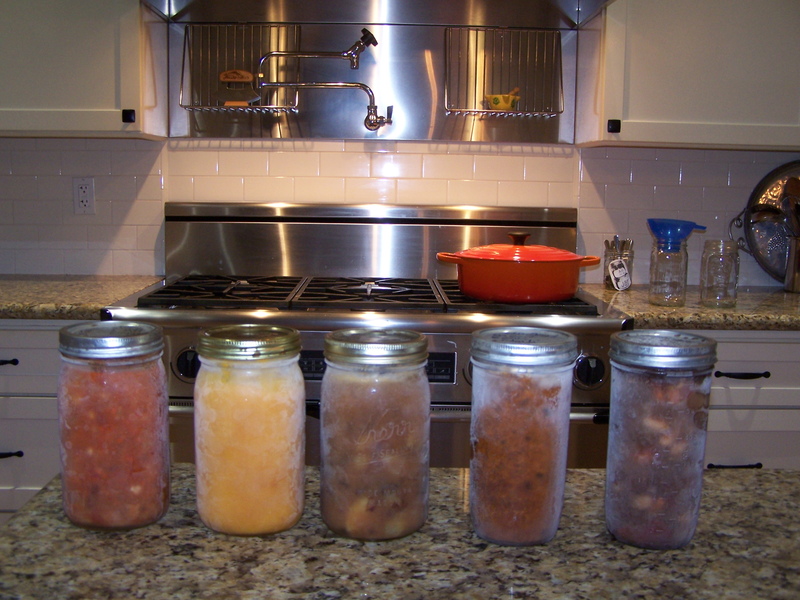 So, did you know that you can preserve that great meal for another cold wet day? Yes, pop it in the freezer for later. Soups, stews and chili are always better a few days after making them, so let them sit in the refrigerator for a day or two. Always use wide mouth jars for freezing, and never feel to the top leave 1 inch head space, because food expanse when frozen. I like to put a small piece of clear plastic wrap on top to keep the ice from build up on top of the food. If you use small mouth jars you run the risk of the jar cracking from expanding. What do you do after making soup. I like putting it into jars for the refrigerator. It is a great way to store it, instead of trying to fit a big pot or big bowl in the refrigerator. The jar on the left is Tortilla Soup, Butternut Squash Soup, Venison Stew, Venison Chili, and Vegetable with venison meat balls. Chicken soup in the pot in the background. Go warm up your home and make some soup.